The Hermetic Order of the Golden Dawn ®: The Hermetic Tablet is Here! 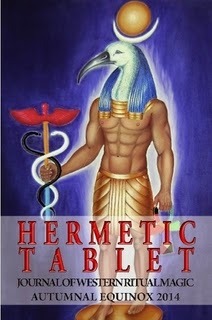 The Hermetic Tablet is Here! The Hermetic Tablet is a quarterly Journal of Western Ritual Magic where people, from all traditions, share their experiences. Some of the contributors are well known names in the occult field, while others are just those who want to share knowledge and experiences with the public. This issue includes articles written by the following writers: Jake Stratton-Kent, Mike Magee, Sandra Tabatha Cicero, Aaron Leitch, Christine Zalewski, Nick Farrell, Paola Farrell, Jayne Gibson, Samuel Scarborough, Harry Wendrich, Alex Sumner, Carman Lawrick, Bro. Yeheshua Netzach, Steve Nichols, Cynthia Caton and Alfonso Ricca.